Lovely, immaculate 3-Bedroom/2-Bath single level home with wood/tile/laminate throughout. Neutral colors, eat-in kitchen and formal dining with cabinet built-ins. Tons of counter space and cabinets in the spacious kitchen. Laundry area with full-size washer/dryer. Master bath features dual sinks, linen cabinet storage, and walk-in shower with handicap-handles/grips. Second full bath with tub/shower. Private entrance and patio/porch off one of the extra bedrooms. Front enclosed lanai offers 220 sq ft of additional space with zoned cooling/heating and electric fireplace. Extended covered carport parking, two outside storage sheds, grassy, landscaped yard, patio with bench, and sprinkler system. Electric lift installed by dining room slider doors. Furnishings, decor, and appliances included! Listed at $199,900 - Call or text Jim Miller at 813-505-2919 for a personal tour! Seller Financing Considered! Light and bright single level condo with neutral flooring and colors throughout. Open floorplan offers combination living/dining room and full kitchen with breakfast bar, pantry, and bay window. Spacious master suite features dual sink vanity, tile-surround shower, walk-in closet, and private screened/covered balcony. Convenient indoor laundry room with full-size washer/dryer and storage closet. Assigned covered parking conveys with this unit. Existing American Shield Home Warranty in place. Listed at $88,500 - Call or text Jim Miller at 813-505-2919 for a personal tour! Click Here for a Video Tour of this property! Condo A6 - Seller Financing Available for this move-in ready 1-Bedroom/1-Bath condo with vaulted ceilings and loft. Colorful stylized unit is offered with furnishings decor, and appliances. Kitchen features stainless steel appliances, double sink, 4-burner range, and additional cabinet storage. Newer neutral carpet in bedroom and loft. Tropical decor with an island theme, mirror accents, and ceiling fans. Enjoy outdoor living and views from your open covered patio with ceiling fan. Perfect for owner or investor! Listed at $70,000 - Call or text Jim Miller at 813-505-2919 for a personal tour! Condo F13 - Seller Financing Available! Fully furnished ground floor vacation condo! Kitchen features granite counter, stainless smooth-top range, microwave, and side-by-side refrigerator. Full bath with tile-surround tub/shower combination and solid surface vanity. Tile throughout this lovely unit with mirror wall accents. On-demand electric hot water heater. This condo is turn-key and move-in ready! Listed at $64,900 - Call or text Jim Miller at 813-505-2919 for a personal tour! Condo G9 - Lovely ground level 1-Bedroom/1-Bath condo with conservation views. Fully furnished with appliances, decor, kitchenware, and linens. Newly remodeled kitchen with new cabinets and counters. Updated bath with tile-surround walk-in shower and new vanity. All new dual-pane windows and tankless hot water. Spacious bedroom with roomy closet and mirror accent doors. Stack washer/dryer included for convenience. Enjoy outdoor living from the screened covered lanai. Neutral colors and flooring throughout this turnkey property. Perfect for owner or investor. Listed at $59,900 - Call or text Jim Miller at 813-505-2919 for a personal tour! Condo #525 - Turnkey condo including furnishings, appliances, and decor. Enjoy water views and outdoor living from the screened covered lanai. Spacious living area with couch seating, dining table and chairs, and wood-cabinet murphy bed. Kitchen features range, microwave, dishwasher, and refrigerator. Full bath with tub/shower combination. Newer AC in 2015 and tankless hot water. Neutral colors and ceramic tile throughout. Listed at $75,900 - Call or text Jim Miller at 813-505-2919 for a personal tour! 21028 Little Magens Loop - Single level 2-bedroom/2-bath home on large grassy lot. Plenty of parking on the paved driveway and covered carport. Neutral flooring and colors throughout. Wood-look laminate in main kitchen and tile in both baths. Indoor laundry room and skylight in kitchen. New AC in December 2018. Enjoy outdoor living in the front screened covered lanai. Fenced rear yard with brick paver patio, outdoor shower, and storage shed. Additional square footage currently set up as in-law suite. Listed at $99,950 - Call or text Jim Miller at 813-505-2919 for a personal tour! 21183 Lazy Days Circle - Lovely 1-bedroom/1-bath home with neutral colors throughout. Light and bright floorplan with berber carpet in living/dining rooms and wood flooring in bedroom. Full kitchen with smooth-top range, side-by-side refrigerator, and dishwasher. Eating nook features additional cabinets/dry bar. Inside laundry with combination washer/dryer. Lots of storage including linen closet in bath and cabinet/drawer built-ins in bedroom. Ceiling fans and mirror accents highlight this well-maintained home. New A/C in 2017 and 25-yr roof. Dedicated gravel parking space on the lot, fenced rear yard, outdoor shower, and storage shed. Listed at $99,900 - Call or text Jim Miller at 813-505-2919 for a personal tour! Furnished 1-bed/1-ba condo with neutral colors and tile throughout, updated kitchen, solid surface counters, smooth cooktop, built-in microwave, and refrigerator. Light and bright with vaulted ceilings and loft providing extra storage or sleeping space. Stack washer-dryer included. Lovely views of the pool & conservation from this turnkey property. Short term rentals allowed – perfect for owner or investor. 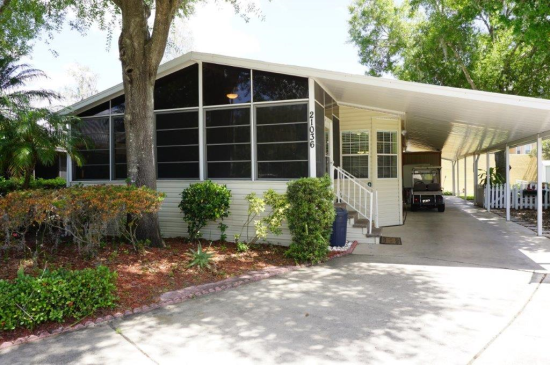 Listed at $64,900 - Call or text Jim Miller at 813-505-2919 for a personal tour! Furnished 1-bedroom, 1-bath vacation condo. Neutral paint and carpet, “stepping stone” pattern flooring, and vaulted ceilings. Mirror accents and ceiling fans in living room and bedroom. Refrigerator, electric oven/stove, and microwave included. Views of the conservation area, pond, and community pool. Great opportunity for owner or investor with tenant in place. Listed at $67,500 - Call or text Jim Miller at 813-505-2919 for a personal tour! Turnkey 1-Bedroom/1-Bath Vacation Condo. Neutral tile flooring throughout with all furnishings and décor included. Kitchen remodeled with new appliances, counter, stainless sink, and pantry. Full bath with tub/shower combination. Stairway to loft area for extra storage. Perfect for owner or as an investment opportunity. Listed at $59,500 - Call or text Jim Miller for a personal tour!